I was talking to a few small business owners the other day, and casually asked if they integrate their accounting software with their CRM, and they all looked at me like I was crazy..
And that is when I decided that I need to write this guide. We all know that QuickBooks is the leading Accounting software for small and medium businesses. It is definitely not the best software for managing your customers. Customer Relationship Management or CRM software are specialized tools that help businesses make more sales and generate more revenue. QuickBooks was not built for that purpose. While I love QuickBooks, it is a software built to manage your financial and accounting. It should not be used to manage your leads, customers or drive sales. "QuickBooks was created to provide you with a robust understanding of your small business financial. It was not built to manage every area of your business.So, just like you don’t expect a server to also be the chef and dishwasher it’s also unrealistic to expect your accounting software to manage all areas of your business." But on the other hand, QuickBooks does store a wealth of customer data that could be used to build long-term relationships, increase customer satisfaction and generate more business. How can you make QuickBooks and CRM work together to increase sales for your organization? That is what we will cover in this step-by-step guide. If you have tried to integrate QuickBooks with your CRM, you already know that the process is not easy. The data structure of QuickBooks is quite different from the data structure of any Customer Relationship Management software. This guide will take you step by step through the process. If you are a small business owner, entrepreneurs, sales and marketing professionals, accounting professionals or anyone who is looking to use the data from their QuickBooks accounting software to build a closer relationship with their customers and generate more sales. If you are looking to create an enhanced experience for your customers so that every aspect of your organization’s communication with them is in sync, this guide is for you. This guide will provide you an easy way to maintain all your customers in one place without having to do double data entry. You will be able manage all communication with your prospects and customers from one common software platform, starting from prospecting stage until they become a regular paying customer and beyond. 1. 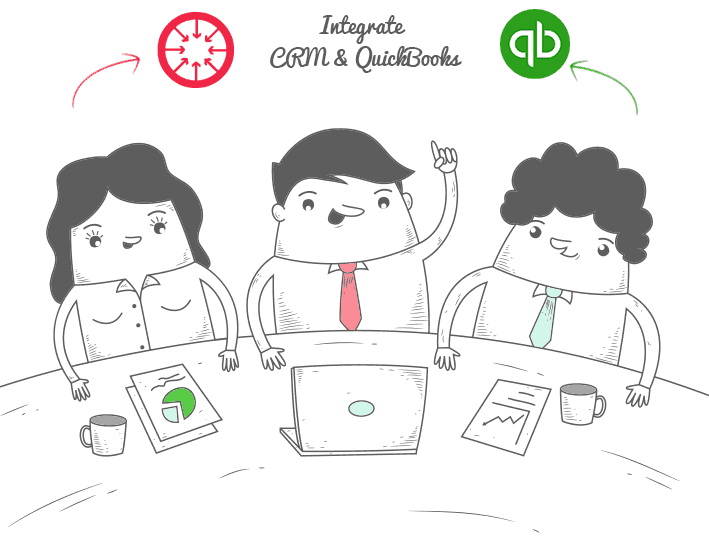 Why integrate QuickBooks with CRM? 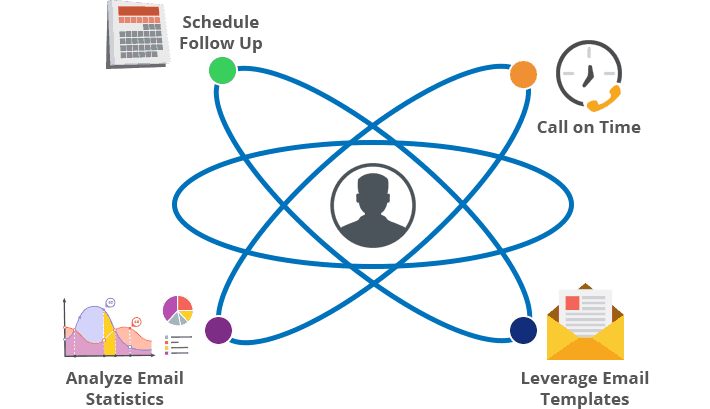 Why integrate your accounting software with CRM? Well, if you don’t care, you probably should. So that you can increase sales and grow your business. The main objective for the integration is not to do better accounting (although there is a high chance of that happening), it is to make more sales and grow revenue. As I mentioned in the beginning of this guide, QuickBooks was built to manage financial and accounting, not for sales or customer management. Integrating it with a CRM helps you unlock the precious customer data that is locked inside QuickBooks and use it from the CRM to drive sales and customer engagement. Once you integrate Intuit QuickBooks and your CRM together, there can be a free exchange of data between the two software applications. You can continue to use QuickBooks for accounting, and at the same time see the customer details, products, invoice and payment information directly in your CRM. You can then use this data from QuickBooks in your CRM for follow-ups, reminders, customer service and business process automation. Disclaimer: The extent of how you can use this data will depend on the specific CRM you use and how closely it is integrated with QuickBooks. If the CRM is loosely integrated with QuickBooks, some of the benefits I discuss will not be available. 1. Better Lead Management – For most businesses, a significant number of prospects or leads who ask for more information or estimates, do not purchase right away. They need to go through multiple follow-ups though phone calls, emails, QA sessions, product demos, free consultations, office visits, or other types of follow ups until they are ready to finally go through the purchase. This type of Lead management and communication, involving multiple touch-points can only be done in CRM. 2. Cleaner QuickBooks – If you manage every prospect or lead to whom you have sent estimates in QuickBooks, it will create a lot of junk data and clutter up your QuickBooks. Handling your leads in a CRM helps you keep your QuickBooks data clean and accounting more accurate. 3. No double data entry – There is a lot of information overlap between sales, order fulfillment, accounting and customer service teams as a prospect moves along the journey from being a lead to a long-term paying customer. If different teams or departments in the company uses different system to manage their tasks, they will have to enter the same data in multiple places, which results in double data entry. And when this data needs to be updated, it gets changed in one system and does not get changed in other, which causes data to get out of sync and different teams end up working based on different sets of data. Double data entry is the bane of businesses, and causes waste of time, waste of effort and most importantly, it introduces human error and causes the systems to have incorrect data. 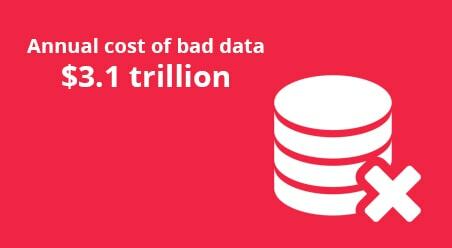 IBM estimated that decisions made from poor quality data costs the US economy $3.1 trillion every year! Having the two main systems in a business, Account and CRM, integrated together eliminates data entry and data errors, so that all teams can work effectively based off the same information. 4. Data Security – Using QuickBooks for lead or customer management increases data security risk substantially. In order to do their jobs, sales team or order fulfillment team or customer service agents need to be able to view customer data. But giving everyone access to QuickBooks poses data security risks. You should not give QuickBooks access to anyone who is not familiar with accounting software as important data can get lost accidentally. 5. Automated Sales Process – An integrated CRM and accounting software helps you automated your sales process. You can send automated follow-up emails to your prospects, thank you mails when they place the order and reminder mails for upcoming service renewal. You can schedule tasks for your team, assign customers to them automatically or create escalations. 6. Sales Efficiency – QuickBooks CRM integration is a must for sales teams. When sales agents follow up with leads, they need all information about that lead in one place. This includes information on all emails, calls, products/services offered, quotations, purchase order, and so on. For a long-term customer, sales agents should have information about open invoices, payments collected, which will help them when they ask for additional sales. Having all information in one centralized place will help sales agents and managers manage all their sales tasks more effectively. 7. Empowered Customer Service – In today’s world, customers are more demanding than ever. They can contact you with questions or problems through phone call, email, support tickets or even social media and they expect answers and solutions immediately. Empowering customer service reps to view all information about that customer in one place helps them serve the customer better and resolve issues before they escalate. 8. Marketing Automation – CRM software that integrates with QuickBooks is key to better marketing automation. Prospects who do not buy from you immediately can be kept warm by keeping them updated with new products and services you introduce, educational information, sales promotions and holiday greetings. This keeps you in front of your prospects and they can get in touch with you in future when they are ready to purchase. 9. Customer Experience – Integrating QuickBooks and CRM helps your business deliver a better customer experience. Each employee in the company has access to all the tools and information they need to serve customers better and more efficiently. This integrated data-driven customer engagement strategy involving multiple departments and business functions is the holy grail of customer engagement that businesses strive for. Now that you understand the benefits of having QuickBooks and CRM work together in sync, you must decide whether it is for you. Should you integrate your Intuit QuickBooks application with a CRM software? 1. Does your sales team have to wait for customer information? If your customer data is located inside QuickBooks and sales team cannot access information like contact details or quotation sent without routing through designated people who have access to QuickBooks, it is time take customer data out of accounting software and move it to a CRM where it belongs. 2. Does data entry keep you busy? Do you have to enter same data in multiple systems? Your sales team uses a different software and fulfillment team uses another and accounting team uses a third one. And they all enter customer data in these different systems. What happens when they update that data? Do they remember to tell other teams to update it too? Or, do you enter same data in multiple systems because you don’t want everyone to be able to access your QuickBooks account? If these scenarios describe your situation, you need to integrate your accounting system with a CRM. 3. Is your QuickBooks full of customers who haven’t paid you and never will? If your company is like most other businesses, majority of the estimates and quotations that you send out do not convert into paying customers. But if these non-paying ‘customers’ remain in your QuickBooks, they just create clutter and slow you down. 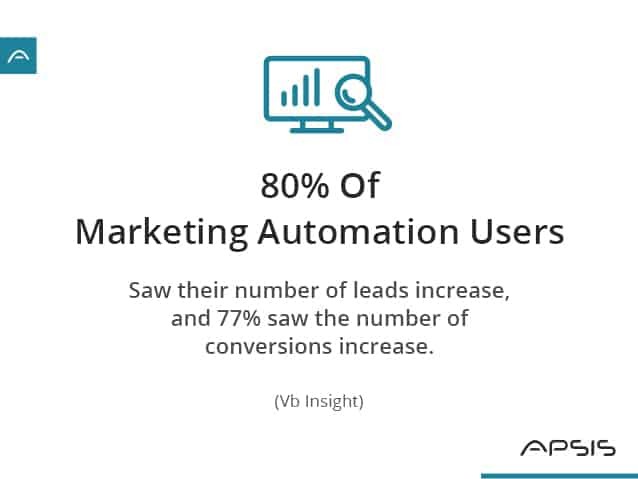 They belong in a CRM software where they can be followed up and kept warm through marketing automation until they are ready to make the purchasing decision. 4. Are you unable to delegate your work? Have you hired resources but are unable to delegate certain tasks to them as you hesitate to handover QuickBooks access to them? Is data security a concern? Accounting data is sensitive, and not every employee should have access to it. 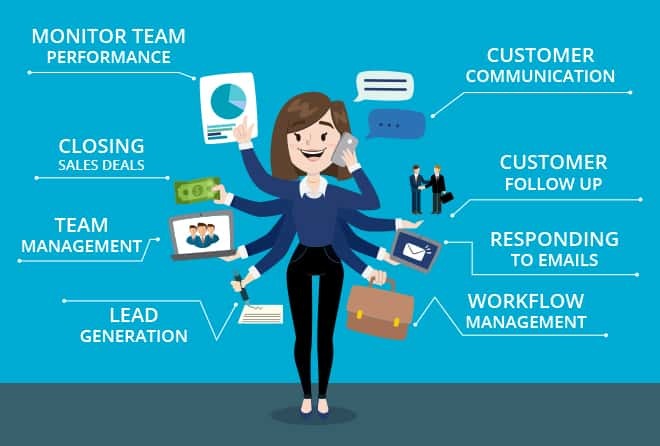 If any of these scenarios sounded familiar and you found yourself nodding in agreement, you should seriously consider having an integrated CRM with your accounting software. Now that you have decided to bring over your customer information from QuickBooks to a CRM, the first step is to decide on which CRM you want to use. Picking a CRM to implement in your company is a tough decision as there are many small business CRMs in the market today and there is a huge variation in the features provided by these CRMs. As you are looking for a CRM that integrates with QuickBooks, the list is already narrowed down for you. Out of the CRMs built for small and medium businesses, there are a few that integrate with QuickBooks, but they vary greatly in the level of integration they provide. It is up to you to examine in detail the QuickBooks integration provided by each of these CRM platforms and pick the one that is suitable for your needs. If you are already using a CRM, find out if it easily integrates with QuickBooks. If not, you may want to consider switching to a CRM that provides QuickBooks integration as a feature. #1 Type of integration – Is it a manual integration or automated sync-based integration? Is it one-way sync or two-way sync? #2 Integration data points – Which specific types of data of QuickBooks are integrated? #3 QuickBooks version – QuickBooks Online? QuickBooks Enterprise? QuickBooks Professional? #4 Existing data – How much data do you already have in QuickBooks? If you’re sick of reading and want to get started with the integration right away, get in touch with me here. We’ll help! I will cover each of these points in the chapters below. i) Manual or On-demand integration – The integration is ‘manual’ or ‘on-demand’ when you push data into the target application one row at a time. For example, in case of QuickBooks CRM integration, if the CRM application has an on-demand integration, you may see a button next to the data entity in CRM that you want to view in QuickBooks, could be customer, invoice, etc. When that button is clicked it will push that specific row of customer or invoice to QuickBooks. This means that the push is done manually, and for every data row that you want to send over to the target application (QuickBooks in this case), a button needs to be clicked. It also means that when you update the data, you must click that button again to send over the changes to QuickBooks. Although this method gives you more control over exactly which data you send over to the target application, it does get very tedious as your data increases or you create or update your data frequently, since you have to push the data over one row at a time. ii) Sync based integration – The integration is ‘sync-based’ when the system automatically monitors data at the back end to detect what got created or updated. Then it sends over the newly created or updated data automatically to the target application. Depending on the version of QuickBooks you have, you may have to set a sync schedule. The software will then automatically sync target application based on that schedule. This method makes it much easier for you as it happens at the background and you don’t have to do it manually one by one every time you create or update any data. i) Unidirectional Data Flow – Simply put, ‘unidirectional data flow’ is ‘one-way’ sync of data between the two applications. This means that data goes from one application to the other, but not other way round. For example, you can have the customers you create or updated in CRM be automatically pushed to QuickBooks, but the customers created or updated in QuickBooks will not be pulled into CRM. The downside of this approach is that the data between the two applications can easily get out of sync with each other. You enter a customer in CRM, and that customer automatically goes over to your QuickBooks. Now any changes to that customer data should be made only to CRM if you want the two applications to be in sync and reflect the same data. If you make any change to the customer data (say, email address or phone number) in QuickBooks, it will not get reflected in the CRM, and CRM will continue to have the older version of the data. What is even worse, if you now make any other change to the same customer in CRM, it will now get pushed into QuickBooks and the old data will overwrite the latest data in QuickBooks. So, the email address or phone number that you had changed in QuickBooks is now replaced by the old email address or phone number from CRM. ii) Bidirectional Data Flow – ‘bidirectional data flow’ is ‘two-way’ data sync between the two applications. This means that ‘push’ and ‘pull’ of data happens in both directions. Any changes made in CRM gets pushed into QuickBooks and any changes made in QuickBooks gets pulled into CRM. That way, data in the two applications can be in sync and there is no concern of new data in one application being overwritten by older data in the other application. ConvergeHub is very tightly integrated with QuickBooks and provides sync-based and bidirectional data flow between QuickBooks and CRM. 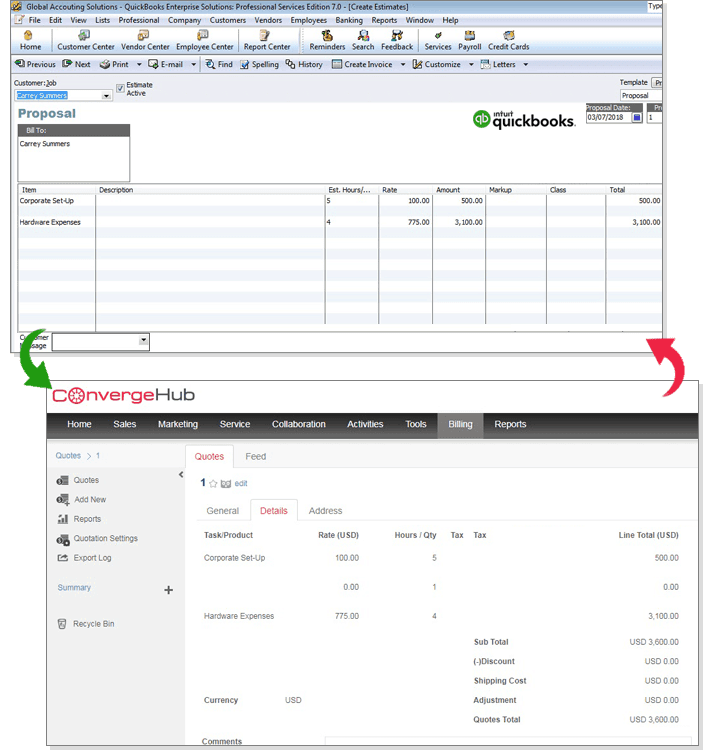 For more information on how ConvergeHub integrates with QuickBooks, check out its QuickBooks CRM integration here. 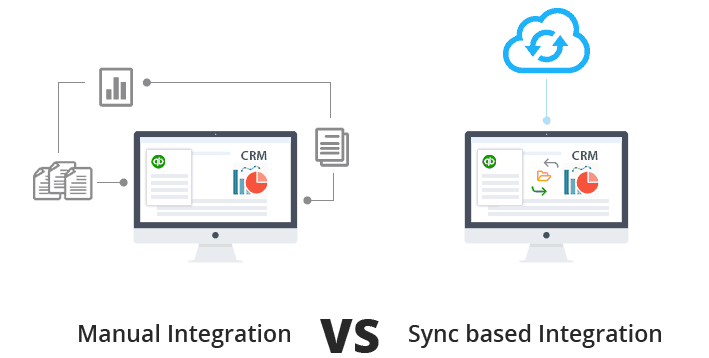 Another major factor that should help you decide which CRM provides the best integration, is how closely the integration works, i.e. how many data points or modules of QuickBooks are integrated with the CRM. Does the integration work with Customer modules only? Does it bring over Invoices into the CRM? If you give discounts or have payment adjustments in QuickBooks, will that show up in CRM? This factor needs some thought as it ties into the main reasons or benefits of why you should go with QuickBooks-CRM integration in the first place. Read the benefits again. Although you may be inclined to think that you don’t need to see Invoices or Payments or your Products or Services in CRM, the main benefit of pulling in these data points from QuickBooks into CRM is that it will allow your sales team, order fulfillment team or customer service team to be aware of this information and therefore provide quicker and better service, which will invariably lead to better customer engagement and business growth. It is now a well-known fact that this kind of data driven marketing involving multiple departments drives customer engagement. Based on the Forbes Insights and Turn report, “Data Driven and Digitally Savvy: The Rise of the New Marketing Organization,” executives widely agreed that data-driven marketing is crucial to succeed in the global economy. While many organizations have some form of data-driven marketing in place, strategies are being implemented in piecemeal fashion, within siloed business units, without fully taking advantage of the resources that are available. 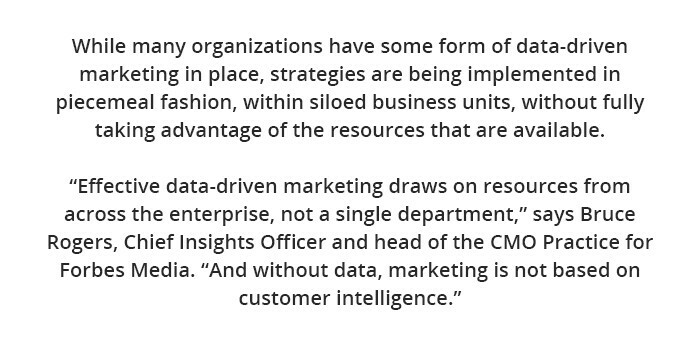 “Effective data-driven marketing draws on resources from across the enterprise, not a single department,” says Bruce Rogers, Chief Insights Officer and head of the CMO Practice for Forbes Media. This is great, but what if I don’t want all my team members to see the data that comes from QuickBooks to CRM? Well, any good CRM worth its salt should provide a way to control data view and access through role and permission settings, so you can decide which team member should have permission to see which data set, once that data is in CRM. The next factor to consider is the version of QuickBooks that you use. If you use QuickBooks Online, you certainly need to have the CRM that you choose to integrate with QuickBooks Online. As QuickBooks Online is a cloud application, it provides APIs (Application Programming Interface) for data exchange. This make is easier for any software application to integrate with QuickBooks Online compared to QuickBooks Desktop versions. ConvergeHub integrates very closely with QuickBooks Online which makes it one of the best CRM for QuickBooks Online integration. 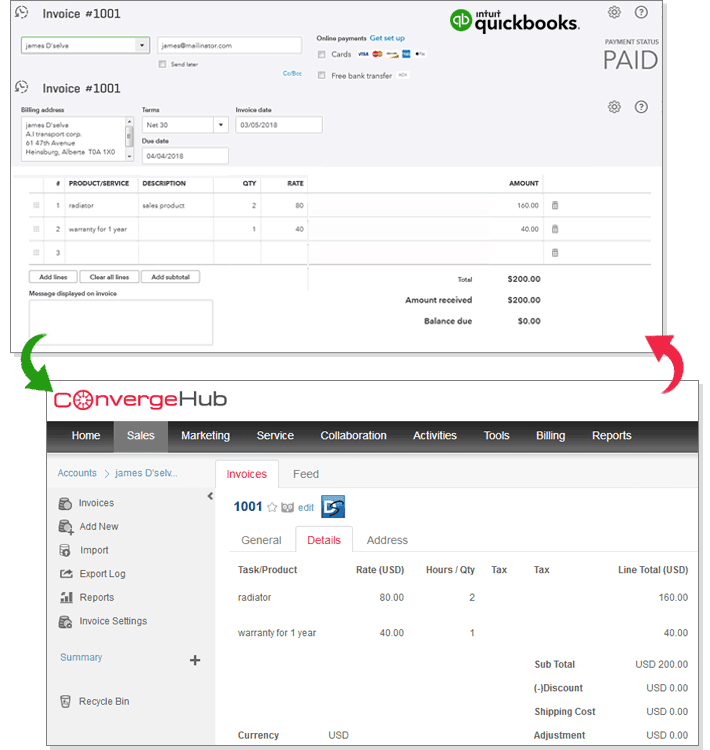 Using ConvergeHub, your sales team will be able to create invoices directly in CRM which will then automatically sync to QuickBooks. You can also create your Products and Services in CRM, create invoices for them and sync the invoices to QuickBooks automatically. You can enter Payments in QuickBooks and view them in ConvergeHub, view transaction history and do a lot more. 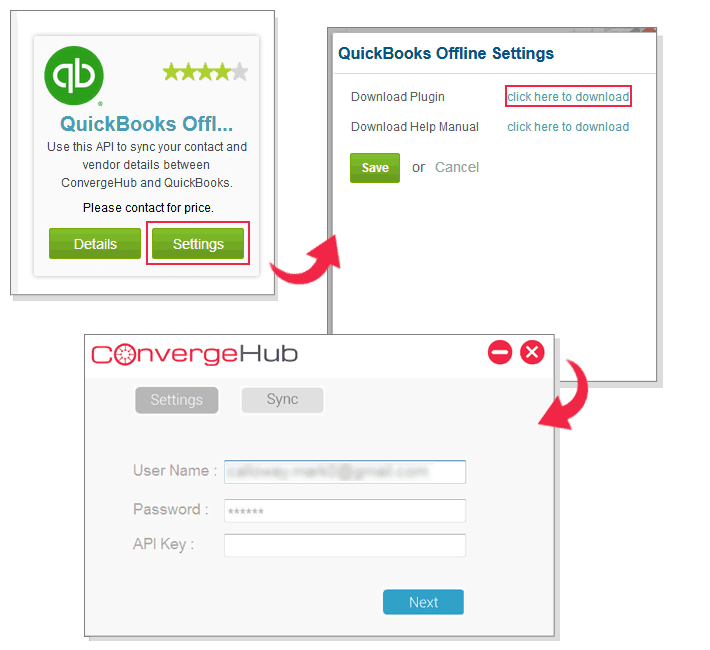 Click here for more information on how ConvergeHub integrates with QuickBooks Online. If you are using Desktop version of QuickBooks, like QuickBooks Enterprise or QuickBooks Professional, you will find that there are fewer CRMs integrating with these versions of QuickBooks. 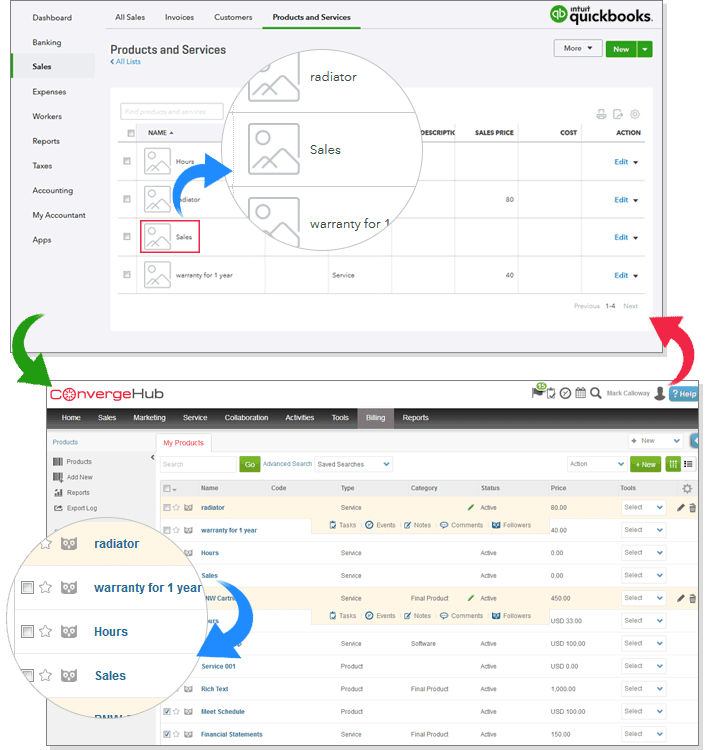 ConvergeHub CRM for QuickBooks Enterprise and QuickBooks Professional uses the same bidirectional sync based approach and efficiently syncs customers, products and services, estimates, invoices, payments, etc. between QuickBooks and CRM. Having such tight integration makes ConvergeHub one of the best CRMs for QuickBooks Desktop integration available in the market. 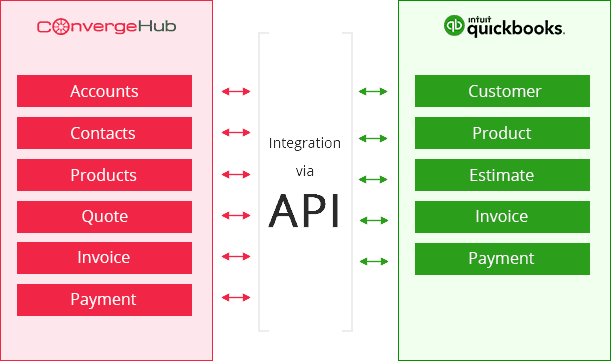 To setup the integration, you have to download the QB Offline plugin from ConvergeHub App Store and install it. Once the installation is complete, set the path for QuickBooks data file, select the sync time frame and you are all set. 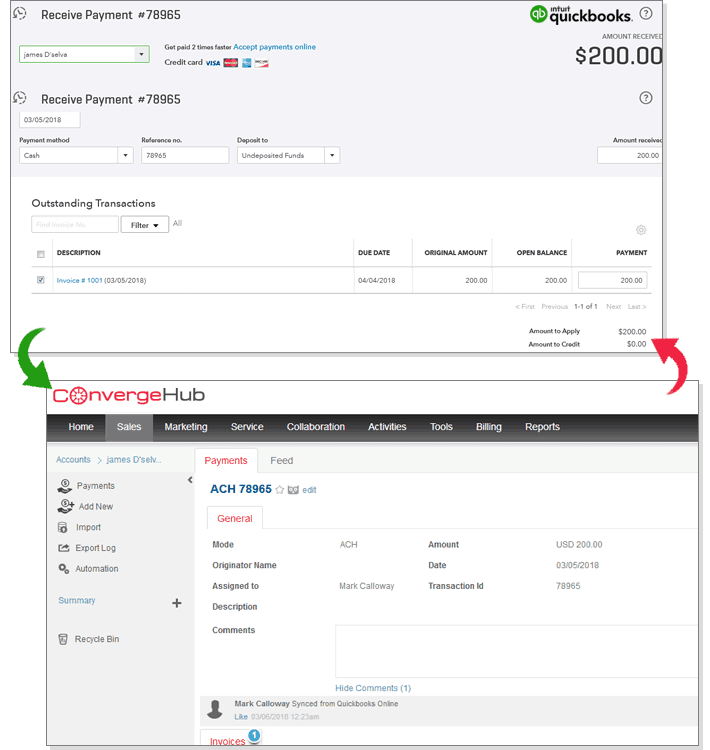 Using ConvergeHub, your sales team will be able to create estimates and invoices directly in CRM and then sit back and let them sync to QuickBooks automatically for your accounting team to work on. You can create your products and services in QuickBooks and let them sync to CRM. You can create invoices for these products and services in CRM and sync the invoices to QuickBooks automatically. 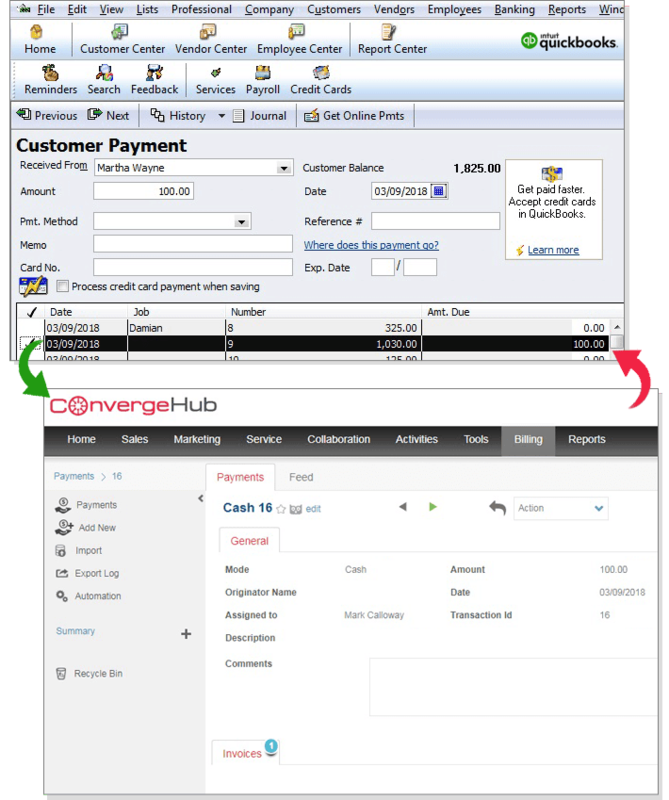 You can enter payments in QuickBooks, apply discounts and view the transaction history in ConvergeHub. 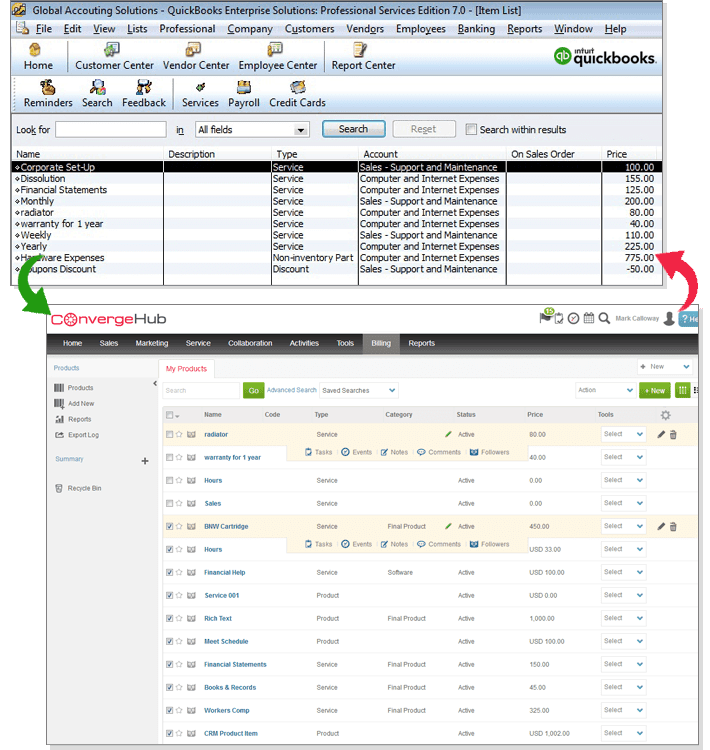 Click here for more information on how ConvergeHub integrates with QuickBooks Desktop. The final consideration before starting your QuickBooks CRM integration is the amount of data you already have in QuickBooks. Your QuickBooks CRM strategy should also depend on whether you are new to QuickBooks and are just getting started or whether you have been using QuickBooks for years and already have a lot of data stored in QuickBooks. i) New QuickBooks accounts – If you have recently set up your QuickBooks account or are in the process of setting it up, your data volume is low or non-existent. It is a good idea to set up the CRM integration right away so that the data syncs between CRM and QuickBooks from the start and you do not have to worry about getting in old data at a later stage. ii) Existing QuickBooks accounts – If you have been using QuickBooks for a while, you probably already have a wealth of information stored in QuickBooks. At this point you need to decide how much of that data you need to bring over to CRM. Navigate through QuickBooks account and see how of that data you are presently using and will continue to use in future. It is possible that you find that certain data types such as customers or products and services will continue to be used in future, while certain data such as old invoices or payments are not really needed. Based on this analysis, come up with a cutoff date. If you have a lot of data to be brought over into CRM, it also makes sense to check with the CRM provider and see how much help their Support team will provide to do the first-time sync. Some CRM providers also provide done-for-you services where they will bring over the past data as needed and also configure the ongoing sync properly for you. As you can see, integrating QuickBooks with CRM takes a little bit of planning. Most businesses either don’t do it at all or don’t put in the necessary effort to do it right as it is easier to continue keep running things as they are. But the consequence of not making the change and continuing things as they currently stand is either giving too many people access to accounting data, which is dangerous in terms of data security, or it means appropriate people do not get access to the data they need to close more sales and provide better customer service. So, put in the necessary effort to select the right QuickBooks CRM provider, switch to an integrated environment, and you will definitely see the results in more streamlined operations, secure financial data, more sales and better customer engagement.